In September I had the opportunity to speak at our local TEDx event, making the case that millennials are the most entrepreneurial generation in history. And it’s true; 1 in 3 of us has already started one or more businesses. This was my first public speaking gig since high school graduation. And it was on the TEDx stage! I love watching TED talks and had always dreamed of giving a presentation like this, so it was a pretty big deal! Just writing this and watching the video is making me relive the uncomfortable nervousness. 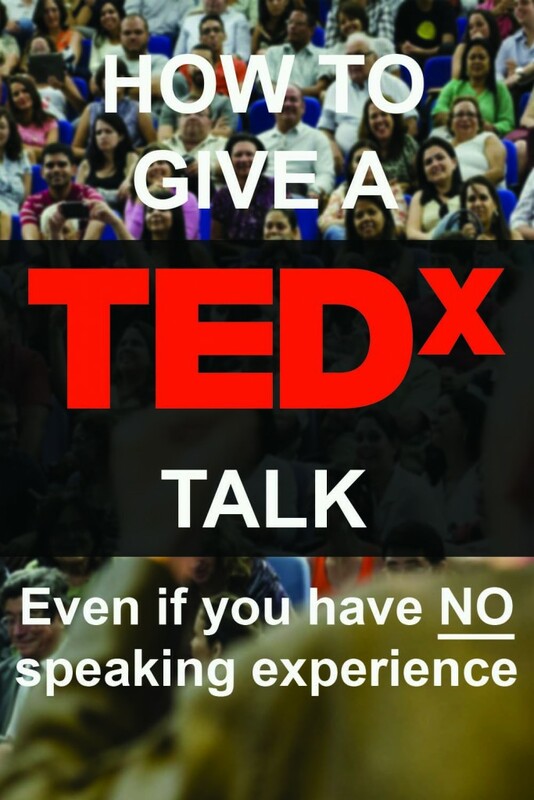 How Do You Get Selected to Speak at a TEDx Event? 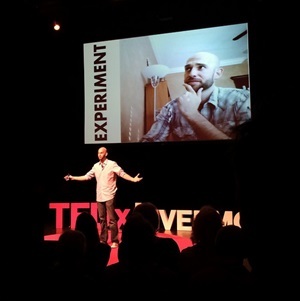 So how do you get chosen as a TEDx speaker? I had no idea, but it was something I wanted to do so I sent a cold pitch email. Hey, if you don’t ask, the answer is always no, right? The only “in” I had was I volunteered a few hours at the 2013 event. The theme of the 2013 event was innovation in education, so my pitch was related to the gap between entrepreneurial education and the real world economic necessity of that education. Since I didn’t have any public speaking I could point to, I cited the podcast as the next-best-thing. When I heard nothing for weeks, I figured they either weren’t interested or weren’t doing the event this year. Then I got an email, explaining that this year’s event was centered on creativity, and asking if I had any thoughts on that. As luck would have it, I did. After a few back-and-forth emails and phone calls, brainstorming what unique angle I could bring to the event, I was officially added to the speaker roster and tasked with coming up with a talk that would bridge creativity with millennial generation entrepreneurship. Hard to ask for a better tie-in to my work at Side Hustle Nation! Later, I found out that nearly all the other speakers were in the personal or extended networks of the TEDx event organizers — so if you want to speak at a TEDx event, the best advice I can give is to find out who the organizers and speaker coordinators are for your event and begin to get to know them any way you can. 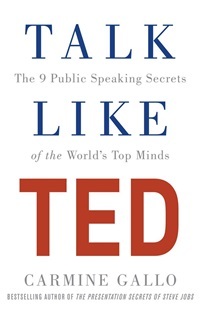 The first thing I did was read Talk Like TED, a book that analyzed the best-of-the-best TED talks to see what they had in common. We remember stories more easily than facts and figures, so I tried to weave in a few stories and examples. For the 3 or 4 weeks before the event, I went on a strict podcast diet, which was my normal pastime while driving or walking the dog. Instead, I used that time to go over the presentation in my head or out loud, talking quietly to myself. I’m sure other people on the road or on the sidewalk thought I was nuts. One weekend while Bryn was off shooting a wedding, I did laps around a hiking trail with my iPad just rehearsing to myself. On stage, there’s no teleprompter and no notes, so I had to commit the thing to memory. I also owe a huge debt to my friend Theresa Campbell (aka Coach T) who helped listen to my presentation and give feedback on my drafts. 4. Teach Your Audience Something New. I sought to teach that millennials are shaking off the label of “The Entitled Generation” with triple the rate of entrepreneurship as the rest of the population. The example cited in the book was when Bill Gates gave his TED talk on eliminating malaria, he released a swarm of live mosquitoes into the audience. Spoiler alert: I didn’t do anything like that. My favorite TED talks are the ones that use humor to help get their message across, so I tried to do the same. But humor is risky because it can bomb or come across as desperate or insincere. 7. Stick to the 18-minute rule. There’s some scientific evidence to suggest that’s about the limit of our attention spans so by rule, all TED presentations are capped at 18 minutes. What I didn’t realize is that for TEDx events, the amount of time given to each speaker will vary to break up the pace of the day as well. I had 13 minutes and was happy to see the YouTube timestamp come in at 12:50 because I lost all track of time while I was up there. 8. Favor pictures over text. This is PowerPoint 101. The slides are there to illustrate your words, or support your points, not to spell out your message word-for-word. This one, like number 8 above, seems kind of like a no-brainer. But I think Gallo meant in terms of telling personal stories and being vulnerable. In addition to reading the TED talk “textbook,” I also watched and re-watched several presentations to get an idea for what I liked and didn’t like. So I owe a big thanks to Jullien Gordon, Sir Ken Robinson, Peter Diamandis (my all-time fave talk), and many more for your silent inspiration. I started out by brainstorming some ideas and talking points, which turned into written rough draft. With only 13 minutes to present, the entire thing scripted out was a little over 1800 words. Bryn and my brother Chris also helped edit and give feedback on the various drafts I created. TEDx Livermore assigned me a speaker coach, Kathy Ohm. Kathy was a HUGE help and we met several times leading up to the event to refine the message and rehearse. She wasn’t impressed with my first draft, calling it “mildly entertaining,” and challenging me to do better. Millennial entrepreneurship is driven both by reactionary and proactive forces. First, the unpredictable and often unfavorable environment we find ourselves in in the economy and workforce necessitates taking matters into our own hands. That’s the reactive part. But entrepreneurship suits us because we value the flexibility, freedom, and impact of doing our own thing. I argue that these are key ingredients in any business venture, and give some examples of what they look like in practice. I note that creativity is often found in unlikely places, and that the 3 Cs don’t discriminate by age. They are open to everyone. I was a nervous wreck leading up to the event. I definitely didn’t expect to be so nervous … I volunteered for this, I kept reminding myself! Bryn keeps reminding me how NOT fun I was to be around those few days. But it had also been a REALLY long time since I’d been on any kind of stage, and my fellow speakers all had such impressive resumes and messages to share. I think I just wanted to perform well and not look like an idiot in front of everybody and on the video. One weird thing was that nearly as soon as I got up there, my mouth went bone dry. Like as dry as it’s ever been. Super weird, but apparently it’s a physiological stress response. It was such a cool event to be a part of. All the organizers, volunteers and speakers were so supportive I loved getting texts on the day of the event from friends rocking their “Everyday I’m Hustling” t-shirts that just happened to be delivered that day. All in all, very grateful for the opportunity! Have you ever done any public speaking? How did you get over the nerves? Is it just a matter of practice? If you were giving a TED talk, what would it be about? What do you think about the 3 Cs? Three I’s for you: impressive, interesting and inspiring! Congrats, Mr. Loper. Thanks for sharing your experience, Nick. I would have been scared shitless too. But great tips and a great post as always. Great talk Nick! Congratulations on getting the opportunity. Very cool! I love that you’re defending millennials as well. Great talk Nick! Didn’t know you had such a great sense of humor. Nicely done. Great job on your TED talk! Just started “following” you a couple of months back, great to see you accomplish this milestone. Congratulations and keep it up! Well done Nick! I love your hustle, your presentation here and your positive energy. Stories make people listen. Connecting with your audience becomes easier if you tell inspired stories. LOL on the Gates presentation. Being a frequenter of all places tropical – going to Bali for the 6th time on Feb 1 ;) – I’d have headed for the hills when those pesky little critters were released into the audience. Nick well done, thanks for your helpful speaking tips! You inspired me man. I loved it, and you ARE CREATIVE! You’re right too – in the world of “entitlement youth” it’s up to us to shine and rise up. Strapped with all that debt, and failed promises (I totally agree, no one our age thinks we’re going to get a damn dime back from Uncle Sam) – it’s about time we take the future ourselves! Love the 3 C’s and I’ve loved collaborating, contributing and creating with you too my friend. Your preparation paid off. Great talk, Nick. Hear that? I’m applauding! I’m applauding your initiative, creativity, and perseverance. Thank you for your inspiration. And thanks for reminding me that there’s no age restriction on the three Cs. Nick, that was fantastic! Your points were spot-on and you’ve got some mad presentation skillz – keep doing this! I’ve done a lot of public speaking and you did the two most important things, IMHO: 1) you prepared and practiced – there is no way around that and it helps with the nerves and confidence; and 2) you looked at the audience. I have found that looking at the faces, or if you’re lucky, greeting people as they come in, is a great way to get people on your side before you’ve even started. And suddenly you realize you’re talking to a room of people you already know. It’s counter-intuitive, and goes against the old adage, to imagine people in their underwear (no!). It’s about being relatable: you to them and them to you. So just keep doing more of these, the nerves will be overcome by confidence. Thanks Rebecca! I don’t know … I found when I was rehearsing, it was WAY easier to talk to strangers than to friends or family. I think because the people we know aren’t used to seeing us in “serious” mode. It’s kind of vulnerable! This is awesome, Nick. I have an important talk coming up soon and I’ll be reading and re-reading this post. I love the tip about going on an intake diet. I love listening to audiobooks and podcasts and while it pains me to put pause on ‘Shoe Dog’ (an awesome book), the situation warrants it.